a daring new design, additional buttons and new macros. There’s nothing written in stone that says an affordable remote control needs to be limited in capabilities. Case in point, the Sony RM-VL series. 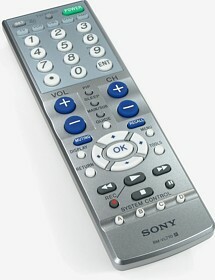 Although items bearing the Sony label are typically associated with commanding something of a price premium, for several years now Sony has actually had the least expensive fully capable universal remote control models available. When the 8-device 11-macro Sony RM-VL900 (read our review) was introduced in early 2000 at a price of $59.99 USD MSRP, it didn’t particularly feel like a monumental event at that time. But the RM-VL900 would hold the crown as the most economical learning remote for nearly two years before being usurped – by yet another Sony model! Right about now you may be thinking that you’ve seen blister pack remotes advertising learning capabilities for far less than $60, but this is one of those cases where it’s important to read the fine print. The RM-VL900 has full learning capabilities, meaning that there’s enough memory to store a learned command on every single key for all devices. Those impulse-purchase remotes place heavy importance on preprogrammed codes and routinely have limited learning capabilities, often holding less than two dozen commands in total. Not even enough for an entire component! Some are further limited to no more than 4 learned commands per device. The next remote from Sony to break the price/performance barrier was the $39.99 RM-VL700 (read our review). This was a simplified version of the RM-VL900, reducing the number of devices to 5 and dropping macros altogether, but it nonetheless had enough memory for a learned command on every programmable button. As you’ll discover from browsing the reviews of bigger and more expensive remotes on this site, customization is a big thing. By allowing any command to be placed on any button, the RM-VL700 provided an unprecedented level of flexibility for the price point. More often than not preprogrammed-only models simply don’t allow users to tailor the remote to their exact components or needs, or if they do it may involve complex and time consuming procedures. As it turns out time really does fly – it’s been nearly four years since the RM-VL700 came out and surprisingly its crown has never been challenged. Despite the RM-VL700 and silver RM-VL700S having aged so well, Sony has decided to refresh their model lineup with a brand new offering, the RM-VL710. Although the slight model number increment would usually indicate only minor changes, the good news is that the RM-VL710 is a complete redesign, merging aspects of the RM-VL700 and RM-VL900 into a bold new remote with a completely rethought button layout. Now for the really good part: the RM-VL710 is affordable at only $34.99 USD MSRP, a full $5 less than the former price champ. Featuring extra buttons, 9 macros and higher quality construction, the Sony RM-VL710 sounds like a certified bargain. But could this be one deal that’s too good to be true?